While drivers need to be more aware of their blind spots, motorcyclists need to be aware of them as well. When passing for example, motorcyclists should not linger along the sides of the car as this is a common area for blind spots. Quickly passing another car will better a cyclist’s chances for being seen by the driver. Drivers should also be aware of how closely they’re following a motorcyclist. In the case that a motorcyclist needs to stop suddenly, a car could rear-end the motorcyclist and seriously injure him or her. When following a cyclist, cars should remain at least a car length and a half behind to allow for more room to stop. All motorcyclists need to be wearing protective head gear when riding their bikes. A helmet can save a cyclist’s life if he or she is thrown from the bike and lands on the head. Helmets save thousands of lives each year, and they can affect auto accident lawsuits. If a motorcyclist is injured in an accident and was not wearing a helmet, the cyclist may not receive a large award for injuries. The courts may rule that the motorcyclist shared some responsibility for the injury by not wearing a helmet. To lessen the chances of injuries, all bikers should be wearing a DOT-compliant helmet. 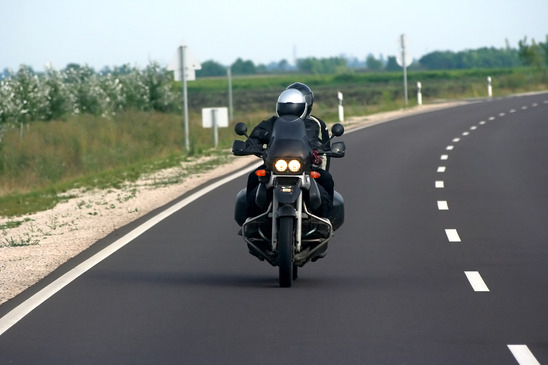 Excessive speed can also play a large factor in motorcycle injuries. Bikers and cars that speed are at a greater risk for causing an accident, and as bikers have less protection, they will be more likely to be injured. California police officers are also stepping up the “Click It or Ticket” campaign to encourage all drivers to wear seatbelts. Seatbelts are to cars as helmets are to motorcyclists. Both protect drivers and passengers from serious injuries. Just be wearing one, you can potentially save your own life or even someone else’s. Road safety is a big responsibility for all drivers, whether they’re in a car or on a bike. Both types of drivers need to respect one another and share the road. If everyone is cautious and drives defensively, we may see a lower rate of motorcycle accidents and fatalities in the coming years.